An air conditioning system is a big investment, which is why it’s important to go with quality technicians and a company you can trust for new installation, annual maintenance, or any repairs that may turn up over the years. Our NATE-certified technicians treat your home with respect and practice professionalism and quality with any AC service or installation call. Russell & Abbott offers quality air conditioners and provide professional air conditioning services serving Maryville, Knoxville, Alcoa, Blount County, Knox County and Loudon County. 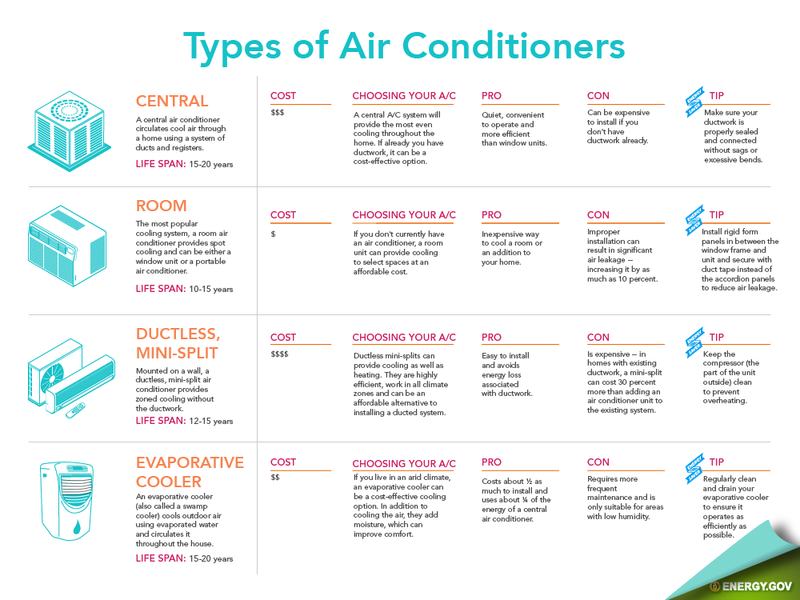 These days, there are several different types of air conditioners available for your consideration. 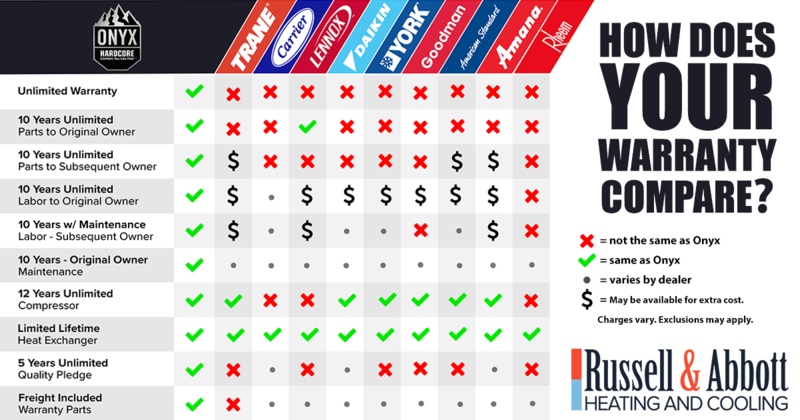 While traditional split system central air units are the most common systems found in homes, heat pumps are a unique option for those looking to replace both their heating and air conditioning systems. Ductless air conditioners allow you the full power of a traditional central air conditioner without the need for any ductwork at all. No matter what type of system you choose, you should select trained professionals to size, install, and service the system in order to keep it running as efficiently as possible. There may be many different options for homeowners to select from, but the traditional split–system central air conditioner is still the most popular system among homeowners in the United States. If you have a working set of ducts, a central air conditioner can provide efficient air conditioning throughout the home, as long as you keep it professionally maintained and remember to change or clean the filter regularly. A technician can help you to select the most efficient, high–performance central air conditioner for the size of your home. Have you noticed hot spots in the home, high energy bills, or even strange noises from your AC system? Most trained technicians advise that you do not wait for a sudden breakdown before calling for AC repair. Schedule service with one of our highly trained and certified technicians today. We guarantee quality service with a 90–day warranty on any service repair. A ductless air conditioning system contains all the cooling power of a conventional air conditioning system without the need for any ductwork. Most ductless air conditioners are incredibly efficient, but only if you choose qualified technicians for the installation. Heat pumps are essentially central air units with a twist: the ability to both heat and cool a home. We specialize in professional installation by certified technicians, and every system is custom–designed to ensure it properly fits your home. We also repair and maintain heat pumps to help keep them in top working order. Thermostats can cut your heating and cooling bill dramatically, as you may find that you can control your air conditioning system with greater accuracy and advanced programming settings. Choose between a wireless thermostat, a programmable digital model, and a smart thermostat so that you can manage the temperature even when you’re away from home. A zone control system helps keep the peace at home. Members of the household may no longer complain about the temperature in the home as they can control their own area, or zone, with a separate thermostat wired to control that location only. Often, homeowners also notice reduced cooling costs, but only when professionals install the new system in the ducts. You don’t need to look far for quality AC service. Count on the friendly professionals at Russell & Abbott, for certified technicians who care about providing quality service to our valued customers.